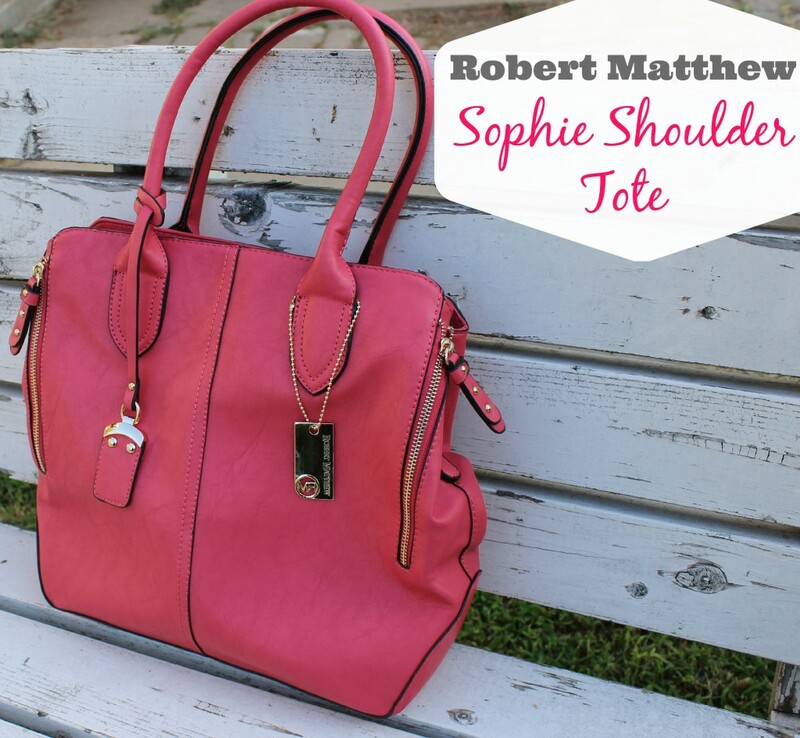 I Adore My New Robert Matthew Sophie Shoulder Tote! I received this tote for free in return to share my honest opinion on it. All thoughts below are 100% my own. A girl can never have to many purses! I recently was sent this stunning Robert Matthew Sophie Shoulder Tote in the color Cayenne! It is a stunning color, and I absolutely love the size of it (13″ W x 12″ H x 5″ D)! I have a few tops that have this color in them, and I thought this would make a fun bold statement color purse to use! I normally stick with black or brown, but I wanted to come out of my shell and pick a new color! 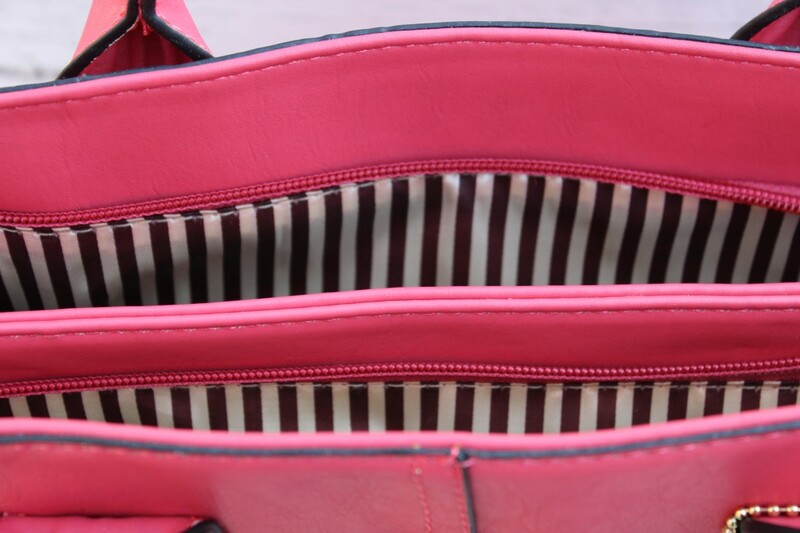 This purse has two main zipper top compartments! It also has a smaller zipper pocket on the back side of the purse. I wanted you guys to be able to see what the inside lining is! I absolutely love this pin-stripe lining! It goes great with the color of the purse! I love the details on the tote! 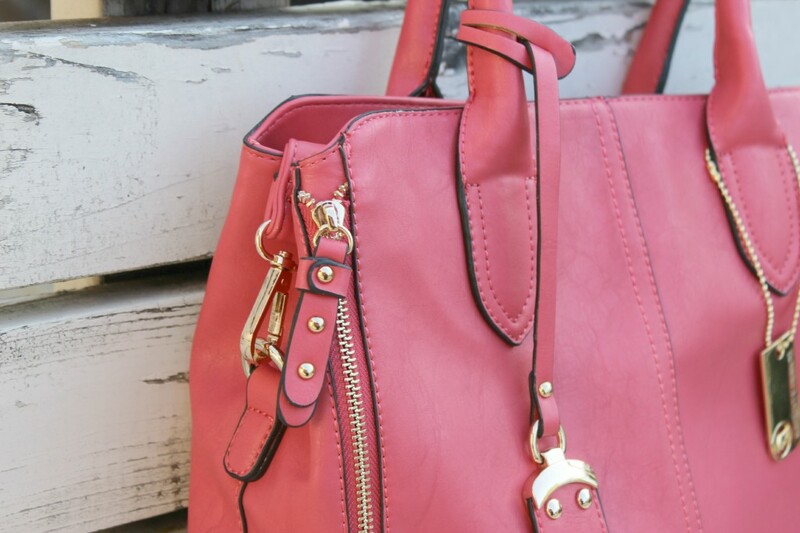 The zippers really add a lot of personality to the purse! I am a huge fan of gold, so I love that they used that for zippers and such! I prefer a larger size bag, and I can fit so much into this purse! I have a bigger size wallet that takes up some room, and in here it still leaves me room for my lotions, hand sanitizer and other items! The quality of this purse is exceptional! 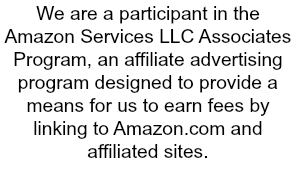 I have been using it for awhile and have had no issues at all. It is made out of Animal Friendly pu Leather, and is nice and sturdy. It also come with an additional handle if you want a longer strap, I just have it tucked inside the purse. What size of bag do you prefer to carry?! Your new purse is such a pretty color and I like it! I have too many purses at my house. Thanks so much Julie!!! I really have fallen in love! Well, it’s really cute, and that lining inside is so pretty! Unattractive lining has often turned me off from a bag. I am so jealous right now. I love it! I prefer to carry a tote, I rarely use shoulder bags. 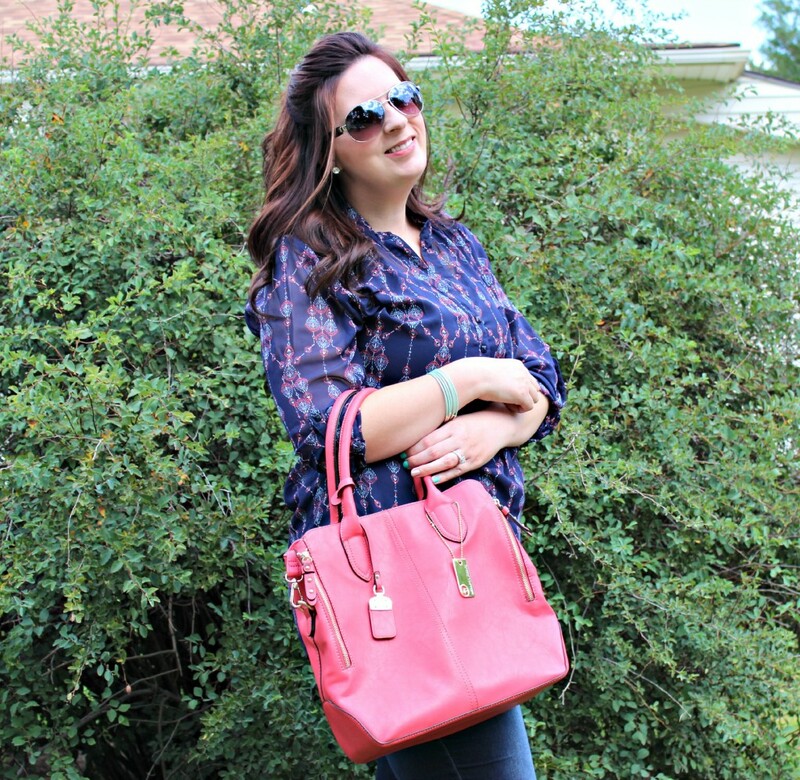 I just love the fun print on the inside, it plays well with the beautiful pink hue! That bag is gorgeous! I love the size, color, and nice design. I want one! that is a nice bag! I love it! I seriously would use it all the time! I love big bags! That is adorable! It is the perfect size for anyone on the go. What a gorgeous bag. I love the color . I agree you cant have to many lol. I like medium sized purses as i find i carry a lot with me. That’s such a beautiful tote! I love that it’s got plenty of space. That’s such a cute bag! I love all the compartments and the hardware! I adore your bag as well. It would be a perfect addition to my Fall wardrobe and would transition well into the spring. I love the color of the purse!!! It looks like a ton of storage space in it which is a must have for me! I love that bag! Give me flip flops and any bag and I am a happy girl! It is really cute! I like how it seems like you could actually fit a lot of stuff in it! I hate carrying really small purses! I really like that bag. Because I have so many kids I need to carry around a larger bag. I miss my little bag I used to carry before becoming a mother. This is a beautiful bag. I love all the small details. They really make it great. That bag is GAWgeous. I love the color, and those zippers are great. That is a beautifully colored purse! I love the trim and the fact that I could fit a lot into it!! LOVE this handbag. I would so use it as a diaper bag because that is all I use these days! I can totally see why you love it. It is cute, stylish, and would look great on my shoulder… ha! I think the one you picked was cute. I like the Hannah Shoulder Tote in Peach too. Now that is CUTE! I love the color. I’ll have to show my girls this, they’d like this too. That is a great bag and that color is perfect for you! That is so cute, the the fabric on the inside too. A great bag makes a person feel great doesn’t it?! I like a big huge bag too. I throw everything in my purse and I want to know everything will fit! That’s super cute! I adore that tote too! That is exactly the size of bag I like to carry as well! Great color! Oh, I would rock that bag!!! That is a really cute purse. I would love to add it to my collection. I love the oversized bags! This one is gorgeous!